As all-encompassing as we've tried to make our site, we acknowledge that there are other places on the 'net with Jonny Quest themes and information. Here are some of the ones we liked. This is a great little blog from Chris Webber about Jonny Quest-related topics: people, art, music and of course, the show itself. Not a high-volume site, but definitely high-quality: what's there is written well, and truly is a "must-visit" for any JQ fan. After posting an underground documentary on the making of Jonny Quest on YouTube, it became apparent that people all over the world wanted to download the doc for their own. So I got permission from the documentary's creators and started my blog first to make the doc available for download, but it has become a place to share music, art and everything Quest related. All are welcome to visit and contribute. Roger Evans is an artist, author, photgrapher, and film-maker. But he is also a huge Jonny Quest fan! Visit his website where he allows visitors to follow along the process as he re-images the classic Jonny Quest opening credit sequence using stop-motion animation techniques. The results are awesome! Cartoon Network's Jonny Quest pages are located in the "Department of Cartoons", and contain a compilation of model sheets, video clips (including a classic 1964 P.F.Flyers TV commercial! ), and much more! If Jonny Quest can be said to have an "official" page anywhere on the web, this is it! NOTE: The previous description used to be true, but as of a recent visit, a major revamp of their pages has taken place -- and all of the previous wonderful Jonny Quest material is GONE. What a bummer! BUT WAIT! Thanks to the magic that is the internet and the wonderful website named the Internet Archive (http://www.webarchive.org) and their "Wayback Machine", we here at ClassicJQ.com can resurrect the OLD SET OF PAGES for you!! Just click on this link and you'll get to see almost everything as it was originally presented on the Cartoon Network website. The link points to an archive from June 2001. The only things that are not retrievable are, unfortunately, the sound and episode and PF Flyers commercial clips (because of the way they were presented originally on the page via a script), but everything else, including all of the storyboards, model sheets, etc. is still viewable! I love the internet! eBay's online auction site offers tangible proof that Jonny Quest is alive and well. You'll be amazed at the number of Jonny Quest items that show up on a regular basis; items change continually, so check the list often! The following links will start various searches of eBay for items that contain the text Jonny Quest as well as the commonly-encountered misspellings (Johnny and Johny) in either the title or the item description. The logo and text link (above left) will take you to the eBay "home" page. Ken Quattro's The Forgotten Art of Doug Wildey from the ComicArtVille Library is an excellent biographical article on Doug Wildey, with some interesting facts and images not often seen. Jonny Quest Glitches from whatsitsgalore.com What's a glitch? Glitches are mistakes in movies and TV shows. They can be technical goofs, continuity errors, or anything that makes you scratch your head and say, "Huh?" This page is dedicated to glitches in the classic Hanna-Barbera animated series Jonny Quest. Most are good (some are duplicates of fan-reported flubs from classicjq.com); a few are questionable or inaccurate. View with an objective mind and have some fun! Don Markstein's Toonopedia has a subtitle of "A Vast Repository of Toonological Knowledge", and the rest of the site lives up to that! Here's the link to the Jonny Quest entry. The Superhero Cartoon Database has information on your favorite cartoon superheros - of course, the Quests are included, even though they don't wear capes. By far the best set of Jonny Quest related clips, not just on YouTube but I dare say on the entire internet, is the 2-hour fan-made documentary entitled Quest: How the World's Most Ambitious Animated Series Came to Television. You can search for this on YouTube, or head to Chris Webber's "From Palm Key..." blog for links. The Classic Jonny Quest Mailing List - a list for discussion focusing on the 1964 show. 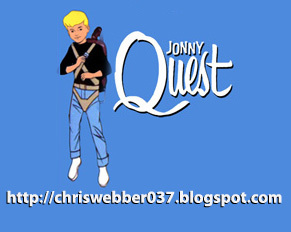 The File037Quest List - a list devoted to classic Jonny Quest. The Jonny Quest Mailing List (JQML) - for discussion on not only the 1964 series, but the 1986 series and the 1996-97 Real Adventures series, plus anything else! Discussion typically focuses on TRA, but all JQ topics are welcomed. If you can recommend a site we currently don't have listed, please let Lyle or Craig know!